Researchers are working to document traditional ecological knowledge. In September 2014, Hurricane Odile barreled across the Baja California Peninsula, sending 30,000 tourists to evacuation shelters and killing 11 people. Odile weakened as it swept into Sonora, Mexico, but its torrential rains still washed out the dirt road connecting the tiny coastal village of El Desemboque to the highway. Local residents, all members of the Seri Indigenous group, were stranded for three days without food or water. Finally, someone managed to charge a computer with a car battery and posted a plea for help to Facebook. That message reached Laura Monti, a research associate in arid lands cultural ecology with Prescott College and the University of Arizona. 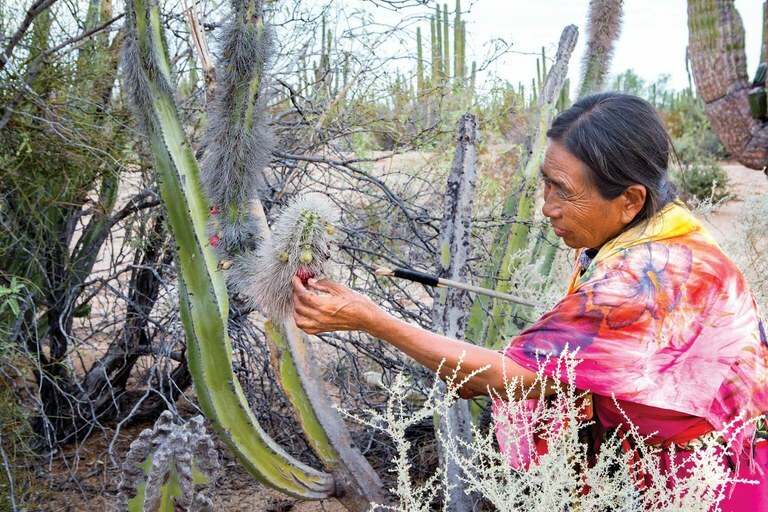 It brought the Seri’s vulnerability to extreme weather sharply into focus, and also gave new urgency to the native and medicinal plants research that Monti has been doing in Sonora for two decades. The Seri, who also live farther south in Punta Chueca, have endured harsh Sonoran Desert and Gulf of California conditions for 2,000 years, harvesting plants for food, hydration and medicine, and hunting on land and at sea. Their lives may become even harder in the years ahead, as intensifying tropical storms, rising sea levels and ocean warming and acidification ravage plant habitats as well as the coastal wetlands that help support the fish that Seri fishermen rely on. 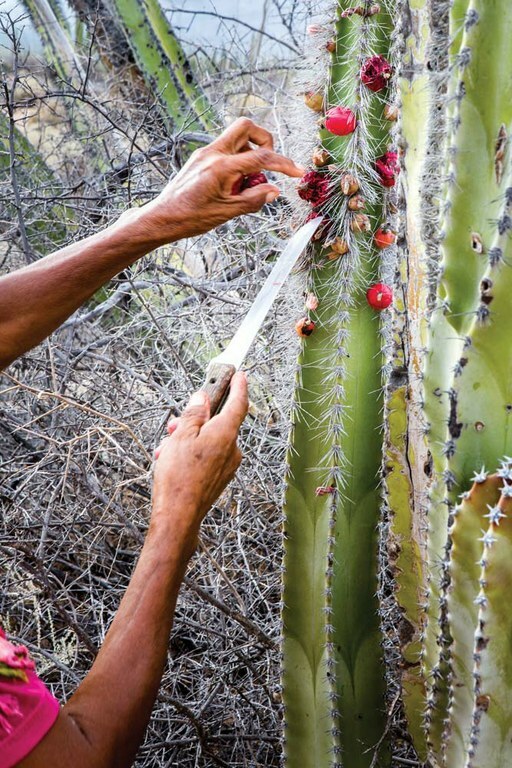 Seri artisan Carolina Félix harvests the fruit of the senita cactus in El Desemboque, Sonora, Mexico. In June, at a parched arroyo just outside of El Desemboque, Monti joined a handful of Seri women representing three generations for a morning of collecting plants and sharing knowledge about their qualities and uses. Diabetes has become a major problem in this increasingly sedentary, former hunter-gatherer community, for example, and the red inner bark of Krameria roots contains chemical compounds that may lower blood sugar, while its taproot stabilizes sand dunes, preventing coastal erosion. The group meets monthly and practices sustainable harvesting — carefully replacing soil after digging up roots, for example. Monti has also led trainings in the conservation of the ironwood tree, a keystone species and important “nurse plant” for many other desert plants. The women study desert ecology and botany and document the environmental changes that they see. Maria Luisa Astorga Flores, an elderly woman dressed in a long skirt and colorful shawl, gestured out across the sparse, sandy expanse of the arroyo. “There used to be many more plants here,” she said, peering over her wire-frame glasses. Because of the site’s location near running water, mesquite trees and plants once flourished here, including broomrape, which has an edible lower stem, and lantana, used to relieve dizziness, Astorga Flores explained. But Odile battered the arroyo, and some plants have not yet recovered. The fruit of the senita cactus can be eaten fresh, and the Seri have used the cactus wood to build shelters. At least 20 percent of Mexico’s plant species are found in Sonora, whose two annual rainy seasons contribute to North America’s richest desert ecosystem. But the hotter, drier conditions of recent years have thwarted the growth of perennial grasses, flowering plants and mesquite trees in some areas. Meanwhile, Pacific Ocean storms arrive earlier and with greater frequency and strength, washing away crucial habitats. Marine life is also vulnerable to climate shifts. Ocean warming and acidification pose risks to the shelled organisms, like saltwater clams and blue crab, that Seri fishermen depend on, as well as to the entire Gulf of California ecosystem — home to nearly 900 fish species and the source of about half the production volume of Mexico’s national fisheries. Well beyond the arroyo, Monti maneuvered past prickly cholla cactus to join the women standing around a Krameria bush. Crouched underneath the branches was 28-year-old Vilma Morales Astorga, expertly scooping away soil with a palm-sized seashell to reach the prized roots. The women explained that the tool had been left behind by a previous harvester — a gift for the next collector to come along. Monti beamed. “It’s really special that she found that,” she said. Sarah Amandolare is a freelance journalist published in The New York Times, The Guardian, Scientific American Mind and elsewhere.